Every night I try hard to make my two kids fall asleep peacefully. It has always been a difficult task but now with the husband being away it has become an herculean one. Every night a lot of effort and time is wasted to make them sleep. In my desperate attempts I start by reading them a bed time story, then I sing all the lullaby I know, I cradle the lil one till my back starts to hurt and then I move to the bed with the toddler on my lap and the first grader by my side. while I frantically move my legs up and down, up and down to rock the baby my right hand tugs and pulls the hair of the sonny boy to give them the comfort they need to fall asleep. and the worst part is till date even after 6 years of being a mother I could not establish a sure shot method to do this. Every night I make a fresh start...trying all my ways to soothe their over active nerves...some days I fail and some days are just a tad better. But this journey of motherhood is not about failure or success. The more I age, the more they grow, the more I learn...the more I understand that motherhood is all about the journey. Though I cannot pat my back to keep my cool all the time. Some days I just lose it and start barking, some days I crib but at least I never say quit, at least am putting my 100% in it and that's what makes our life beautiful. Somehow the kids also understand that and I know am almost there when just before falling asleep my little girl pats the pillow besides her and says" Mummum shue por"(come lie down mother). and then just like a spell of magic things go quite. All the giggles,laughter, fighting, lullaby, humdrum make way to peace and silence. And all of a sudden the darkness envelops us. While I carefully tuck them in, a million plans cross my mind to use this precious time of mine. As I move my tired limbs, it creaks and pleads to be stretched and relaxed. After a few minutes the eyes start to droop and I could barely manage to thank God for another beautiful day before drifting away to sleep. These garlic knots were baked as a treat for the kids. For that matter most recipes that calls for all purpose flour or maida are seldom cooked in the house and when I do they are meant to be shared. But then for some recipes the healthy flour just cant do the justice. 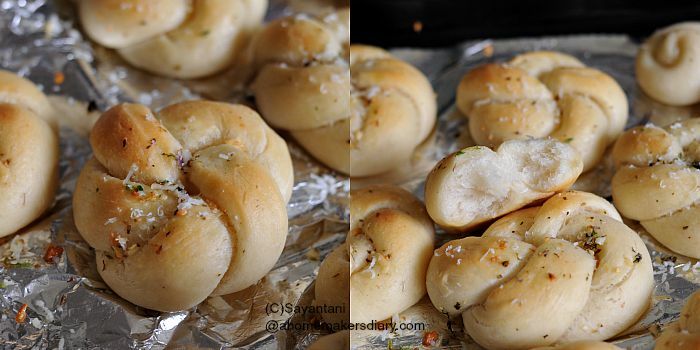 This pillowy soft and almost as light as air garlic knots are one of them. Though I bake a lot of these recipes with Atta but you just never get the same texture, same mouth feel and same experience from its healthier counterpart. so once in a blue moon these are baked in small batches, which the kids relish on their own or sometimes with quick roast chicken or with cheese slices. Parsley or any other herb of your choice or dried seasonings etc. Mix the salt and flour and place in a big bowl. Clean your counter with soap and water for kneading. Heat 1/2 cup of water till its just warm to touch. Mix in the sugar and the yeast. Make a well in the center of the flour and add this. Bring it together. Add the milk and try to make a dough. If you need more water add 1 tbsp at a time till there is no more visible dry flour. Make a sticky dough. Cover with a bowl and keep aside for 15 minutes. In the mean time line a a couple of baking trays with aluminium foil or butter paper. Grease them lightly and keep aside. After 15 minutes take out the dough on your counter and start kneading. Grease your hands from time to time and slap it on the counter, stretch it and bring it together and do this vigorous kneading for atleast 10 minutes or till the dough does not feel sticky anymore and have a smooth velvety touch to it. The dough should be bouncy and when poked lightly it should spring back. Tuck the sides of the dough inside and make a smooth rough ball. grease a big bowl and also the dough and wrap with cling film. Keep somewhere hot and let it double in size for 45 minutes to an hour. In colder climates you might need to rest it more. I prefer to place my dough in the switched of microwave. Once the dough doubles take it out of the bowl and lightly punch it. Make 10 equal pieces and roll each piece in a long smooth roll. Work with one piece at a time. 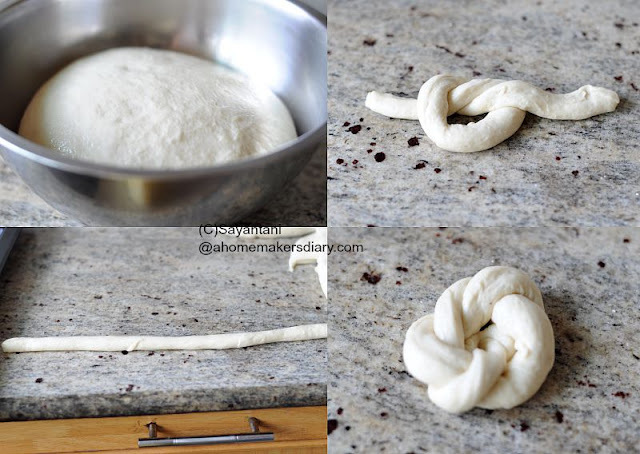 Grease your hands and the dough and tie a knot in the center of the dough. Then take the end that is on top of the knot and bring it underneath the knot. The end below the knot should come up and tucked with the other end at the center of the knot. It sounds difficult but once you actually get down doing it am sure you will somehow figure it out. Repeat with all the balls and place them on the tray. Cover with a greased piece of cling film and let it double for another 30 minutes to an hour. Now its time to mix all the ingredients for the garlic oil. Just mix everything together and keep aside. Somewhat at the end of the proofing time pre heat the oven at 175C. Just before putting them in the oven brush them generously with the oil. Bake for 15-17 minutes or till they are slightly golden in colour. Take out and do a second round of brushing with the remaining oil. Enjoy them warm. You can also keep them in the fridge for upto 3 days and reheat whenever needed. Do not over bake them or you will get dry chewy buns. check after 12 minutes and watch like a hawk after that. You can also sprinkle grated parmesan after the buns come out of the oven. You're one hell of a woman. I can't imagine how you manage two kids alone, cooking, shooting and blogging. But dear, keep doing it and keep inspiring us. 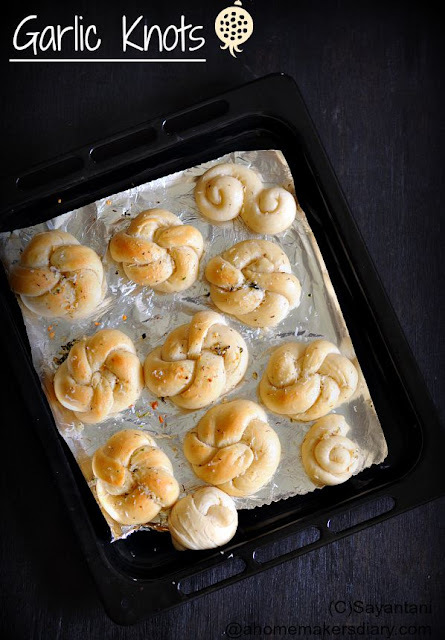 These garlic knots look the best - I am not much into flours or any white carbs these days otherwise I would bake it right now. It's so tempting! Love and lot of hugs! thank you Dolphia. really appreciate your comment. Sayantani , You are doing a fab job with the kiddos and your blog. I can totally understand how it is running the show single handed. 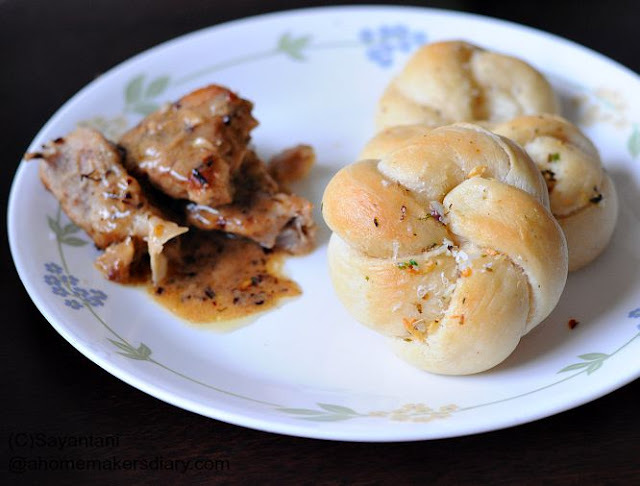 Anyways the Garlic knots are fab and they make a perfect treat to the kiddos and self. Hi Sayantani.... great recipe. Is there a microwave variant? I would be really interested in that one. Please let me know if you have some tips on microwave cooking. Love your blog. @Shaz, thank you for writing to me. if you have convection mode on your microwave then you can bake them. In absence of any kind of oven try the pressure cooker method. Lay a thick layer of salt in a pressure cooker and then put a steel or aluminim stand on it (not more than 2" in height) and place your baking tray (Steel/aluminium) on it and cover without the pressure. Cook on low it will act as an oven. Try this method with a bit of dough first.